After last week’s 43 minutes of wasting the audience’s time by saving Skye—a character whose life I have a difficult time imagining is worth risking anything for—in the show’s usual staggeringly dull fashion, there was at least a tease of an appearance of an actual Marvel character, if only a minor one. Now, Thor was not one of the titles I read growing up (despite my Norwegian heritage), but I’m at least aware of her by reference through other Marvel books as the sister of the Enchantress, a character who definitely qualifies as a major thorn in the God of Thunder’s side. 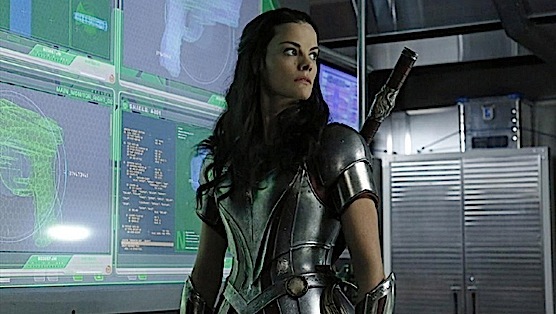 This epilogue was followed by a teaser showing Sif (Jamie Alexander, who’s appeared in both Thor movies) tracking Lorelei to Midgard and whirling a sword. I admit: I raised an eyebrow in cautious optimism. But, then, I remembered the season’s eighth episode (“The Well”) in which Asgard was first represented on the show, and I wondered briefly if I might still be trapped in the snooze-induced coma that episode triggered. Yet, watching tonight’s episode, I thought I must be dreaming: Watching a week of Agents of S.H.I.E.L.D. that isn’t trapped somewhere between “boring as hell” and “terrible”?! Basically, I’m almost not sure what I just saw. Stumbling their way nearly three-fourths through the first season, the showrunners appear to have to finally face-planted onto a formula that could make Agents work: a formula already used by most other action-tinged sci-fi/fantasy TV shows with any sort of continuity. Let’s take a look at the most obvious example (given the top billing in Executive Producer credits): Buffy the Vampire Slayer. Many people don’t (and many die-hard fans outright refuse to) remember that its first/early second season was pretty bad. Really bad, in some cases. One thing it did do, to its benefit, was establish a framework for setting up a larger arc by introducing recognizable, standalone obstacles to grow its main characters around: Vampires. Witches. Mummies. Demons. Zombies. Robots. Werewolves. Black Lagoon-ish Creatures. Whedon whipped up a batch of known quantities in folklore and pop culture to create opportunities for the characters he still needed to establish to develop around, via challenges the audience was already at least tangentially familiar with. But despite the across-the-board disappointment that was the first 14 episodes, after number 15, I can honestly say I’ll be even more disappointed if the show gets pulled—as long as it uses this most recent episode as a guide and allows these characters the chance to grow into the roles. (Or be killed off, Skye.) The difference between this Agents and last week’s is pretty damn dramatic. Even Clark Gregg would seem to concur: In the beginning of the episode where he’s still reeling from learning the (partial) truth of his return from the dead, he fishes for answers by pulling in favors with a buddy from elsewhere in S.H.I.E.L.D. “How was Tahiti?” asks his colleague. “It sucked,” replies Phil, donning his shades and peeling off.